A couple nights ago I got on my main arena team Now You Die. It's 2v2 with myself as a Ret Pally and my partner as a Holy Pally. This is not a common pairing but that's a discussion for another time. We come across a team called LeeT HaxorZ, composed of a Warlock and Paladin. Immediately we have to make a decision on who to take down. Normally we would go for the Paladin since he can heal. HOWEVER the Pally had the same 2H sword I use so we quickly realized he was a Retribution Paladin. As such we went for the warlock. The fight was very evenly matched but eventually we take down the warlock. However in the next second the other Paladin finishes off my teammate leaving myself and the other Ret pally to fight it out! To make matters worse, while I had more health then my opponent I had much less mana, around 500. As you know a Pally without mana is a dead one. Fortunately I have two stuns available to me, I start with Repentance and use the seconds to bandage myself for more health. I quickly see that this wasn't the best move as my health is going down pretty quickly and the damage I'm dealing is a bit less then my opponent due to my using auto attack and the occasional crusader strike as not to completely run out of mana. At this point I'm lower on health and mana then my opponent. I use my hammer of justice to stun my opponent for another 6 seconds. During that time I run out of his line of sight and drink up to regain my mana. I get up to around 1500 mana before my opponent finds me and starts wailing away. We trade blows back and forth but I stop for a minute and Heal myself. (I was concerned I wouldn't get the heal off in time but I had no choice). This is enough to give me slightly more health then my opponent with maybe 1000 mana left. We're back to trading blows, but I remember to throw down Consecration since we're in close proximity to each other and that's enough to give me the edge. I win the battle, and thus the match with well under 1,000 life... basically one more solid hit and I would have died. Arena is full of choices, starting even before the gates open. Since my team is 2 pally's we plan our Buffs and aura's to complement each other. You'll want to do the same with your teammate. He gives me BoK and give him BoW, I put up the Improved Sanctity Aura for +12% holy damage and he puts up Concentration Aura for an improved chance not to be interrupted for heals. It works for us, but you'll want to tailor your blessings and/or buffs to you and your partner's needs. The first major choice in the battle comes when you see your opponents. Who should you target first? Healer/DPS combo - you need to target the healer. Otherwise the healer will just sit back and keep on healing thru your damage. Eventually you'll run out of mana or stuns and then they'll go on the offensive. Healer/Healer - Ugly, very ugly..... Go with the one that you think is the better healer. For example a shadow preist is not as good at healing as Holy. Alternatively you can try splitting up after the initial burst damage to keep them both occupied. Send your strongest DPS against the main healer, the other guy keep the secondary healer occupied. Melee/Melee - Usually a warrior and someone else (hunter or rouge). This really depends on the situation, but remember that a warrior gains rage when attacked making him more powerful, either ignore him outright or take him down ASAP. Mage/DPS - Usually go for the cloth, they die faster and deal more burst damage. 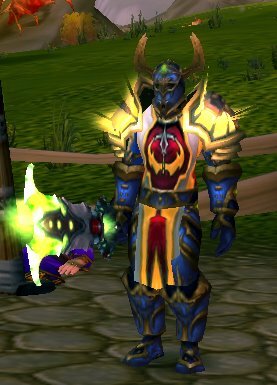 Battle Auras - As a ret pally you should start out with Improve Sanctity Aura, but if you see there's a Warlock around, switch to Shadow resistance. Other classes may or may not need you to switch. Bottom line is you need to adapt to your situation, don't be afraid to change Auras. Trinkets - You're going to be stunned a lot in arena play. Having a trinket to dispel at least 1 stun is a must. You have two options Insignia of the Alliance and Medallion of the Alliance. The cheaper one only costs 2,805 honor and removes 1 stun effect every 5 minutes. The Medallion 16,983 honor. It removes 1 stun effect every 2 minutes AND gives 20 Resilience. If you're getting a lot of honor per week (15k or more) save your honor and get the Medallion. If you average less then 10k honor per week then go ahead and get the Insignia. Mana Potions - You cannot use regular mana potions in the arena, but there is a drink you can use called Star's Tears. It restores up to 7,500 mana in the arena, you have to be out of combat to use it. Believe me, after 160+ matches this season I've been using this more then I would have thought. Twards the end of a long fight it's possible no one is doing serious damage due to lack of mana. Have your teammate occupy both guys for a while and drink up for a few seconds, if your teammate uses mana do the same for him. Also, if you've just managed to kill 1 team member but you're both out of mana... again one person keeps the guy busy the other drinks up. Communication - Last on this list but THE MOST IMPORTANT. If you ever want to get above 1,500 you MUST have a microphone headset and use something to talk to your teammate, whether it's the in-game voice option, ventrillo or teamspeak. You cannot stop fighting to chat with your teammate. Voice is even more important then gear! Speaking of communication. Don't just jump into your next match. Take a minute to discuss why you won or lost; see where you could improve and think about a strategy if you get the same team again... I often see the same team(s) in a given night. Just stumbled across your blog! nice work so far! As a fellow Retri Paladin i feel your pain, but also relish in our ability to knock the crud out of players in pvp! My pvp gear isnt as impressive as yours right now as the majority of my gear is PvE spec from raids. So its a good start!! PS - I've added your blog to my blogroll! I hope the blog provides some great info for you. I'd love to see your armory profile (www.armory.com), your AP and Crit stats are amazing, especially since you mention your gear is not as good as mine. Sorry broken link.. this one should work. You couldn't find him because he is on the EU realms. I'm nearly always in my PvE gear though. I'm going to do a nice post on my pvp gear stats at some point this week so i'll drop a link to my blog when its up! !